Once you've learned the basics of melt and pour soap making, you can start playing around with different techniques to make your soap look fancy. Layering soap is a simple procedure that can result in beautiful, colorful bars made up of stripes of different shades. Use this basic method to create a variety of layered looks. Your soap layers can be simple matching shades or you can jazz things up with contrasting colors. The secret to successful layering is the use of rubbing alcohol. When spritzed lightly onto the soap's surface, the rubbing alcohol helps the layers adhere and removes air bubbles. Here's the basic method for making a bar of soap with two distinct layers. Set up the double boiler with water in the bottom pan. Insert the top pan and place on the stove. Bring the water to a low simmer. Chop up your soap chunks and place them in the top of the double boiler. Stir the soap occasionally and gently as it melts. You don't want to stir too vigorously or too often, because stirring can incorporate bubbles into the soap. When the soap is almost completely melted and smooth, turn the heat off on the burner. Add fragrance if using. Pour half of the melted soap into the glass container. 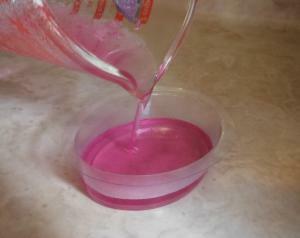 Add soap dye, a little bit at a time, until you reach your desired shade. Pour the soap into the molds, filling them halfway. While the poured soap is beginning to cool, add the contrasting soap dye to the remaining soap in the double boiler. When the poured soap in the molds has cooled enough that there is a thin skin on top, spray the soap lightly with rubbing alcohol. This helps the next layer to adhere. Pour the second layer of contrasting-colored soap to fill the molds. You can spritz the bottom with a bit more rubbing alcohol if there are bubbles present after pouring. Allow the soap to cool completely, then pop out of the molds. Smooth any rough edges with a vegetable peeler or the back of a hot spoon. 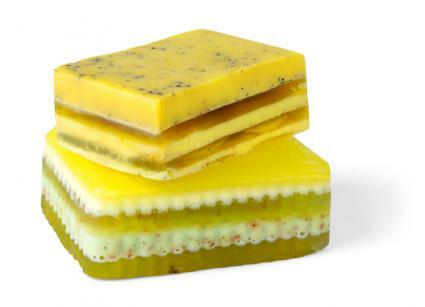 Your layered soap is now ready to use. If you won't be using it right away, wrap the cooled bars tightly in plastic wrap to keep them from drying out or fading. 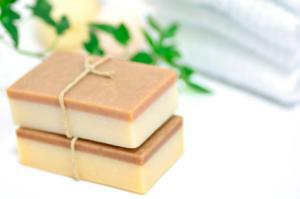 Store unused soap in a cool, dry place away from direct sunlight. Once you've got the basic method down, you can start to explore different ways to make your layered bars look like fancy spa offerings. Try some of these suggestions to create eye-catching soap. Pour a thin layer in a dark color first, followed by a lighter, creamy, thick layer. When the soap comes out of the mold the thin layer will be on top and look almost like frosting. Using graduating shades of the same color eliminates the need for mixing your colors separately. Simply color all of the melted soap in a light shade and make your first pour. 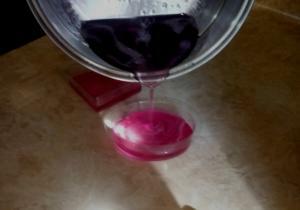 Then add more dye to make the shade darker and pour again. You can do as many layers as you'd like to fill the mold with this method. Combine transparent and opaque layers for visual appeal. Stir additives such as herbs, dried flowers, or Epsom salts into the first layer and contrast with a simple colored layer. Gently stir cosmetic-grade glitter into the soap for one or more layers. This works best with transparent soap base. Use one single fragrance to scent the bar, or opt for complementary oils for an overall scent. For example, scent one pink or red colored layer with strawberry fragrance oil, followed by a white or cream layer scented with vanilla to create a strawberries and cream bar. If your soap mold has a raised design on top, fill the design itself with a bright color and layer with a contrasting shade to make the design really pop. Pick colors related to holidays, such as red and green for Christmas, or choose colors that match those of your favorite sports team. Melt and pour soap making lends itself to endless creative possibilities. Once you learn how to create colorful layers in your bars you can start to use your imagination to come up with all sorts of interesting and original looks. These hand-crafted soaps make great gifts for either gender, too!